As I sit at the bar waiting to speak to Paul and Anthony Ramirez, two of the three owners of the Bronx Beer Hall located in the middle of the Arthur Avenue Market, I look around and notice my fellow patrons. The place has only been open since February 1st, but they sit sipping beers out of mason jars with familiarity, as if the place had always been there, or even as if the people who frequent the market had been waiting for something like this for quite some time. Complete strangers begin conversations about the neighborhood with one another over pale ales, hard ciders, and glasses of wine expertly paired with the dynamic menu by partner and Chef David Greco of the market's superbly successful Mikes Famous Deli. The vibe of the place is a mix of old school and new. The bar itself is made from 18th century wood reclaimed from an upstate barn. The white tiles add a clean, contemporary feel. 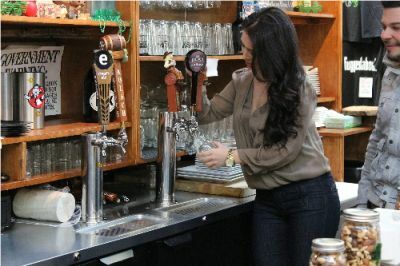 The beer hall sits in the center of the space across from the famous Peter's Meat Market. While little Italian ladies five feet away yell out to their favorite butcher to wrap them up a nice lamb's head, young men in ironic t-shirts take your order with a buzzing mini i-pad. When I suggested that the overall atmosphere of the hall felt similar to Williamsburg or rather "Bronx-burg," owner Anthony was quick to correct me. "I take issue with that. Williamsburg is made up of a bunch of transplants. My Brother and I were born and raised in the Bronx and we celebrate it. Our goal was to re-introduce the market to people living within the borough as people who aren't from the Bronx." It was clear that they were on a mission to give back to their community in one of the most iconic spaces the Bronx has to offer. The Arthur Avenue Market has been in business for the better part of a century, but probably hasn't seen this much action from people under age 50 in years. "We're trying to catapult the Bronx into the 21st century" says Paul. I was really impressed that these enterprising brothers had managed to open such an impressive business in such a short time span. In December of 2011, Paul and Anthony whose other ventures include a Media company, Mainland Media, and a Bronx memorabilia website, FromTheBronx.com, hosted a pop-up shop for the holidays in the Arthur Avenue Market. Originally, the shop was only supposed to be there for thirty days, which was their longest temporary location. The success of the pop-up shop prompted them to hold a beer tasting, which was successful in driving a demographic of people to the Market that had eluded it in the past. Impressed with the new wave of customers, partner Dave Greco and all vendors included suggested they find a way to make their presence permanent. 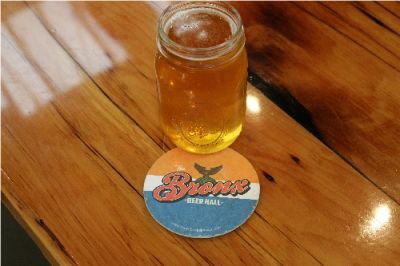 FromTheBronx.com- Bronx themed merchandise, reproductions of Bronx artwork, including the logo for the Bronx Beer Hall which was designed by Paul and Anthony featuring the colors from the Bronx county flag and is a play on the Jonas Bronck's family crest. 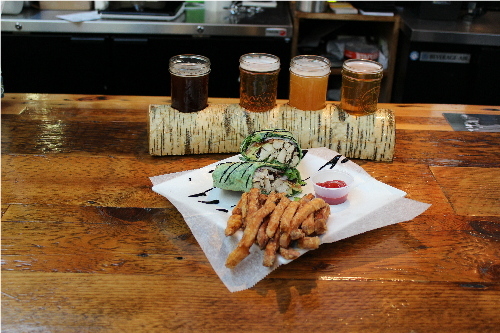 What truly sets the Bronx Beer Hall apart is without question the food. Ingredients sourced from within the Market come together to create a dynamic menu that manages to do justice to the melting pot that is the Bronx. 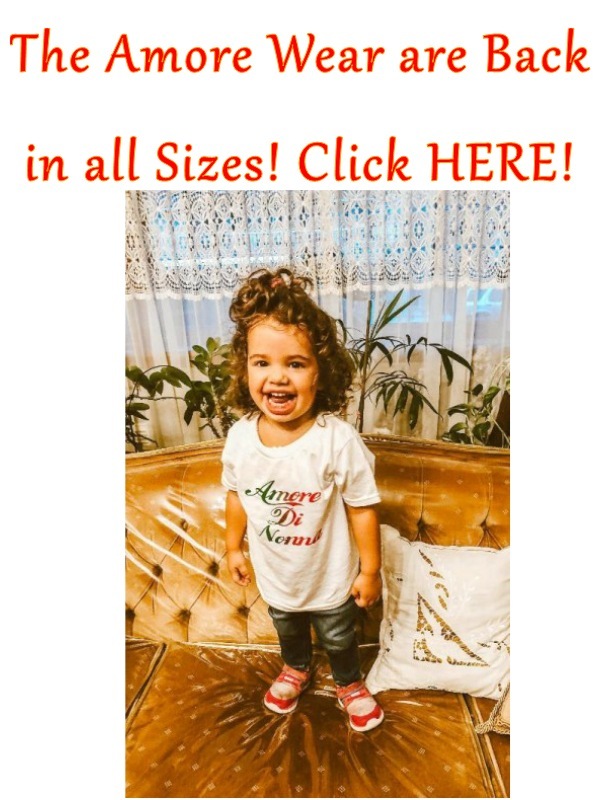 Paul tells me, "We wanted a break from the traditional Italian food available in the area and more representative of the different cultures found in the Bronx." In fact, the menu has something for everyone. There are crispy Baccala fritters, Pork Sliders, Flautas, and the creatively named We Rub You Korean Pork Salad. The standout dishes on the menu are the Wrapper's Delight, a delicious and refreshing chicken avocado wrap, and the Beer Hall's signature dish: Greco's One & Only Truffle Burger. Upon reading it's description (sirloin & filet mignon tips stuffed with Osso Buco topped with crispy Speck, Fontina cheese & caramelized onions) I had to pause and reflect on whether or not a burger this perfectly decadent could taste as good as it sounded. It did, every bit of it. From the perfectly crispy Speck to the sweetness of the caramelized onions that flows together beautifully with the Fontina cheese... it was enough to make me forget all about the 2 hours and change it would take me to get to Arthur Avenue by Subway. 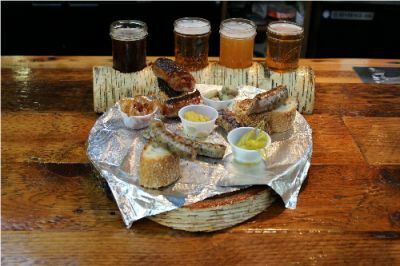 Perhaps the most cohesive dish at the Bronx Beer Hall is the Sausage Fest, which can only be described as an appropriately inappropriate amount of sausage. Ordered all together, six different sausages are paired with six different sides to create a platter fit for a king. Among my favorites were the broccoli rabe sausage (clearly they knew someone from Bari was coming) and the liver sausage, which melts in your mouth like butter. The sausages and sides are also available a la carte. What I found most intriguing about the menu was the section titled Silence of the Lambs. 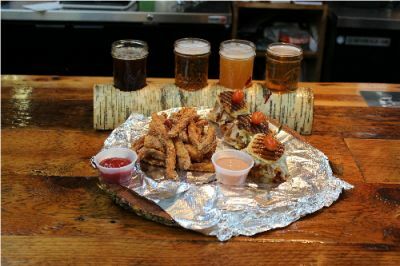 Dishes like sweetbreads served over orzo, calf liver with shallots and balsamic, and crispy calf brains served with Greco's dipping sauce were all suggested by Chef Greco to compliment the beers currently on tap. The unique offerings were a unanimous decision. "He was right, after a couple beers people tend to get a little adventurous and say hell, I'll try some brains." 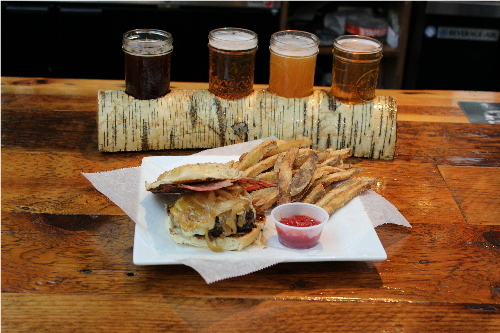 And of course, no Beer Hall would be complete without Beer! The hall has five taps total which will be changing beers every month. Their goal is to feature all Beers brewed within New York state. 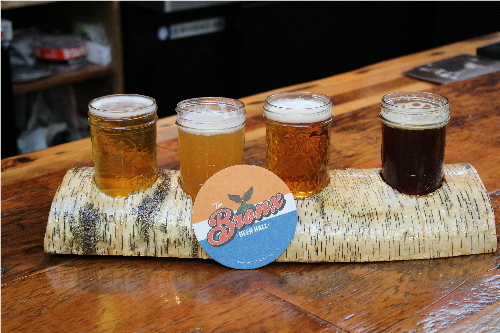 The Bronx Beer Hall proudly serves beer from the Jonas Bronck's Beer Company which offers two beers: Pelham Bay IPA and Woodlawn Weiss, as well as a hard Cider. I really enjoyed the Woodlawn Weiss, a wheat beer that was named after the Woodlawn section of the Bronx for it's German population. The hard cider was sweet, slightly spicy and refreshing. The other Beers available this month are an Empire Cream Ale, and a Captain Lawrence Kolsch Liquid Gold, which will alternate with an Ithaca Nut Brown. Beer specials are buy one get one free pints, five days a week from 4-7pm. The innovation behind the Bronx Beer Hall is both impressive and inspiring. They've brought "brunching" as a verb to their borough, and are currently the only establishment that offer brunch (or "Drunch" as Anthony appropriately named it) to Arthur Avenue. As a young person who embarked on a business with a dream, I thoroughly appreciate when I see young people bring their dreams to fruition -- especially when they make delicious food and coin phrases like "Drunch" while they do it. I applaud this bold new endeavor in this incredibly classic place that brings together Paul & Anthony's seamless love for the Bronx.